The subway system of Moscow serves a double purpose. On the one hand, it remains a cheap, expedient way to travel throughout the capitol, and to avoid the smog-laden, collision-strewn nightmare which is contemporary Russian traffic. On the other hand, they act as a living memorial to Russia’s not-so-distant Soviet past. A comparison between the Moscow Metro and Canada’s largest metro system, the TTC, suggests that there are fundamental differences in the way Russian and Canadian societies relate and exhibit their respective history. 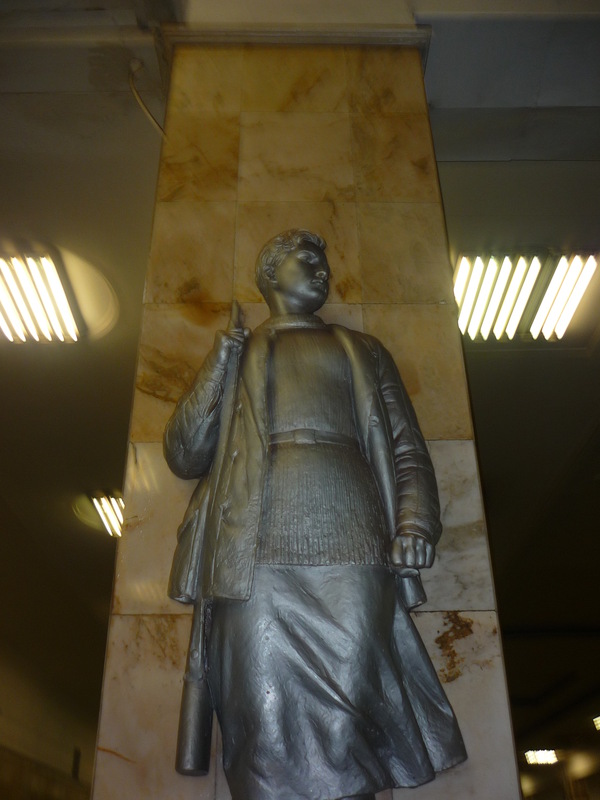 The subway stations of Russia’s greatest city are monuments in their own right. Art and engineering are synthesized into a living design used by millions of people daily within the stations. As Russian subway stations are housed much deeper than their North American counterparts, one inevitably comes to a steep incline serviced by dual escalators, which seems to drop into the centre of the earth. Once underground, the stations’ marble floors are often connected to high ceilings with monolithic neoclassical pillars. Granite, stone, and, in some cases, semi-precious minerals mould the stations into visual masterpieces. The differences between the Moscow Metro and the TTC do not end there. In Moscow, the conductors don’t watch passengers entering and exiting the trains while they shut its doors. When embarking on a subway, everyone in the crowd pushes, jostles and forces their way into the carriage. If you’re uncertain whether you’ll make it on time, a safer prospect is to wait for the next train to arrive. On average, Moscow subways pull into their stations at a frequency of once per minute. The combination of epic neoclassical architecture and ultra-realistic artwork into a functional modern design reflect the Moscow system’s origins as a Soviet artistic and ideological project. It may not come as a surprise, then, that after a quarter of a century, the stations are still embellished with bronze statues, inscriptions and reliefs commemorating the glories of Communism and the Soviet Union’s military victories. The names of the stations echo this past as well. In Moscow, our hotel backs out onto the Partizanskaya. Built during the Second World War, the station commemorates the partisan fighters who resisted the Nazi invasion. Upon entry, one is greeted by an enormous bronze statue depicting three soldier-citizens, accompanied by the inscription “To partisans and partisan glory!” Once underground, statues to popularized Great Patriotic War martyrs flank the tracks of the subway. 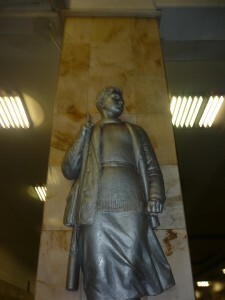 Included here is a statue of Zoya Kosmodemyanakaya. One of the most acclaimed Soviet martyrs of the 1940s, Kosmodemyanakaya was reputedly sold out to the Germans by a Russian collaborator after setting fire to buildings in the town of Petrischevo in an effort to stymie the German Eastward advance. Recently, the historical factuality of her story has been called into question. However, whether her story is apocryphal or not, Kosmodemyanakaya remains an important figure in the cannon of Soviet Second World War heroism. From here, it is a short jaunt to Ploshchad Revolyutskii. Located directly under Red Square, this station is the central terminus of the Moscow metro. 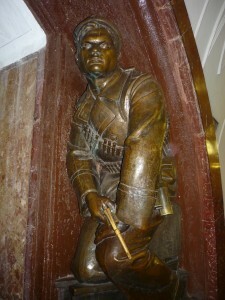 The station is adorned by dozens of bronze statues paired under red marble arches. The statues depict the figures of students, soldiers and workers side by side, and are meant to characterize the diversity of Soviet citizenry. One of the more striking examples of nationalistic artwork is on display at Park Pobedy (Victory Park). The station, which extends a startling 84 metres underground, is situated underneath a gigantic memorial to the routing of the Wehrmacht from Moscow, and more generally to the Soviet victory in the Great Patriotic War. It is perhaps fitting, then, that the wall at the end of the now-familiar red marble archways sports a large mural commemorating the Soviet victory against Nazi Germany with powerful visuals. The mural depicts throngs of overjoyed Soviet soldiers celebrating in a liberated Russian cityscape. On each side of the mural lies a collection of Nazi flags and golden eagles, which have been trampled by the Soviet defenders. Disturbingly, the red, white and yellow stars which relay a sense of celebration across the piece appear to be launched in the air, supported by spurts of bright red blood. The intense atmosphere of the mural is all the more surprising considering the piece was unveiled in 2003, over a decade after the Soviet Union imploded.One might well group the inter-city train system between Moscow and St Petersburg along with the Russian subway systems as historical monuments and constructions of memory. Unlike the subways, the rail system of Russia has undergone massive changes since the Soviet Union’s collapse. Throughout the Soviet era, rail was state-controlled, heavily subsidized and thus utterly affordable for the common Russian citizen. However, with control over the system now in the hands of private rail companies, the cost of taking a train in between the cities has skyrocketed, making it an out of reach service for the average Russian. Nevertheless, the train stations encase patriotic, popular memory just as much as the subway system. In Moscow’s central station, underneath an inscription dedicating the building to Vladmir Lenin is a row of three plaques commemorating its establishment. Flanked by two railroad pioneers, the figure of Tsar Nicholas I is celebrated for establishing the Moscow-St Petersburg rail line in November of 1851. Meanwhile, in St Petersburg, the trains commemorate Russia’s past as well. 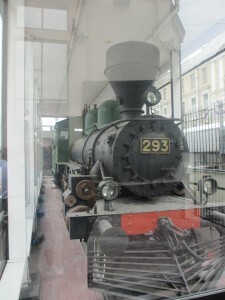 In a corner rarely visited by tourists, Locomotive 293 reposes encased in glass inside the Finlyandsky Rail Terminal. 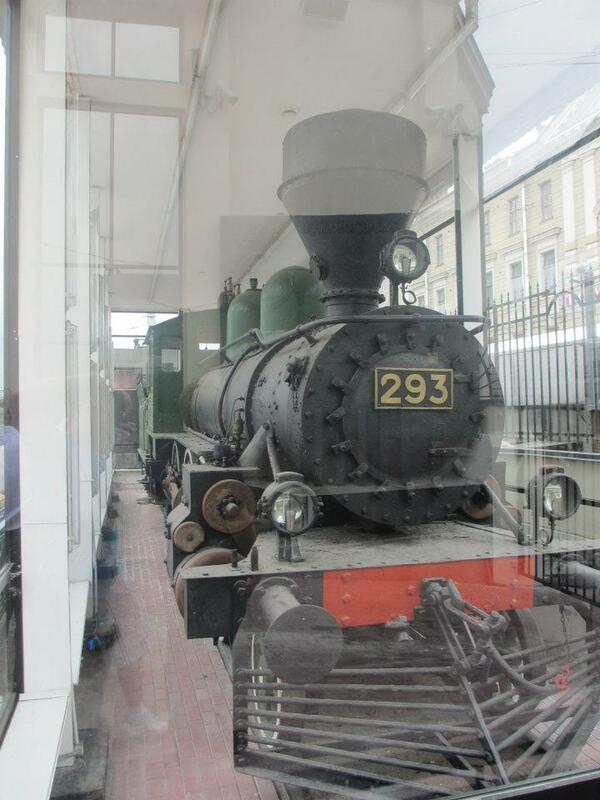 It serves as a nearly identical replica of the train on which Lenin departed from exile in Switzerland through Germany into St Petersburg, then known as Petrograd, to deliver his April Theses and lay the groundwork for the 1917 October Revolution. A plaque notes that it was ‘donated’ to the Soviets by the Finnish government in the mid-1950s, at a time when the country was still very much under the thrall of the Soviet Union. 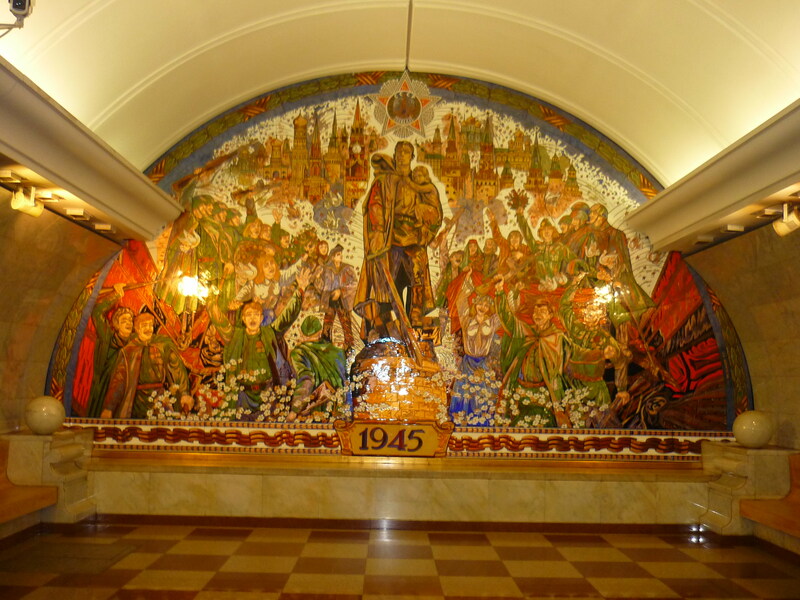 It would be too easy from a North American perspective to dismiss memorialization within the subway and train stations of Russia exclusively as embodiments of communist propaganda. It is true that the murals, statues and architecture inside the stations enforce a mythologizing narrative of Soviet heroism, especially in regards to the Great Patriotic War. However, the commemoration present in Moscow’s transit system goes beyond mere ideology. 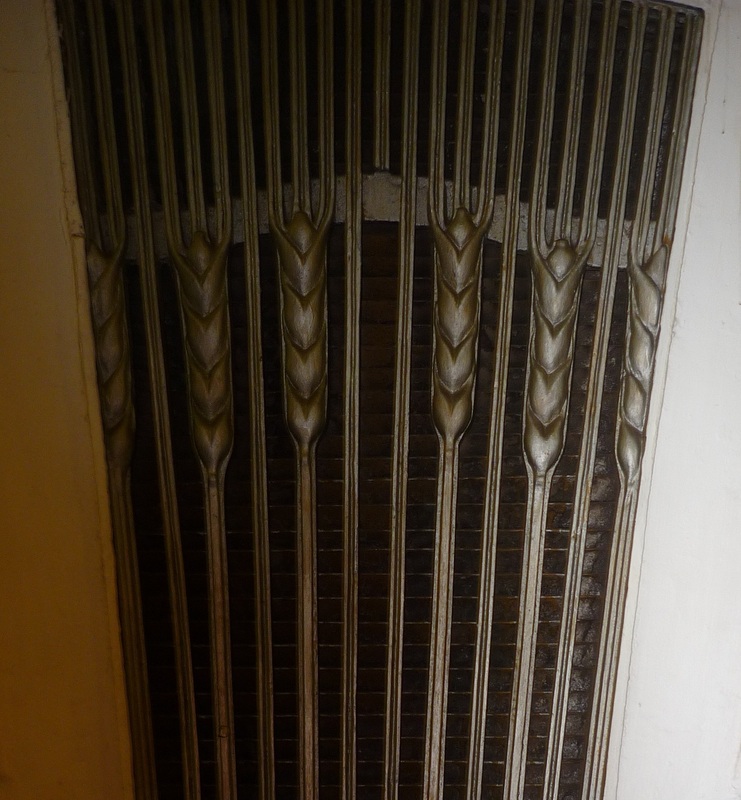 Interpreted on a purely aesthetic level, the Moscow Metro is both beautiful and elegant. The system’s unique synthesis of art and history can be used to gage the way Russian society expresses itself. In Toronto, the subway system is largely devoid of historical landmarks. Instead, the TTC has established a more cultural vision for their lines. Thus, the artwork inside the Toronto subway tends to either be community-based, or simply art for art itself. There are several Torontonian subway stops which feature prominent murals, including College Station’s Hockey Nights in Canada and Dupont Station’s A Spadina Summer Under All Seasons. 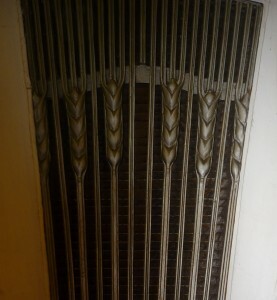 However, all too often these artworks are encased in a decaying shell, dingy from minor neglect. Moreover, while the faux-mummies and totem poles underneath the Royal Ontario Museum may be a kitschy tourist attraction, they jarringly contrast the absence of Canadian historical artifacts. Indeed, Toronto’s subway stations are usually not designed to make any statements to morning commuters, historical or otherwise. 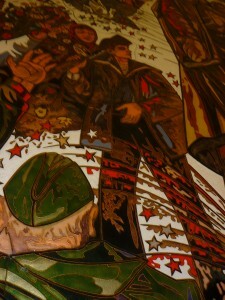 Detail of the mural at Park Pobedy. Note the spurts of blood below the red, white and yellow stars. This absence points to a fundamental difference between Russia and Canada. In Russia, especially in Moscow, the citizenry cherish their public spaces as important institutions. There is precious little private space to be had in that city of 14 million. Instead, Muscovites live life almost exclusively in public. By drinking, loving, and conversing in the parks, streets and subway stations of Moscow breathe life into their public spaces to an extent that is inconceivable in Canada. In Toronto, the subway is seen as a painful experience, where one hopes to simply get from one area of the city to another. They are places where no one speaks to each other, and everyone tries to avoid eye contact at all costs. This is not to suggest that Muscovite commuters find taking the morning trains any more palatable than their Torontonian counterparts. Nor is it to denigrate the TTC as a less luxurious form of the Moscow Metro. It is simply to point out that the priorities of the cities’ respective subway systems, and to a larger extent their public spaces in general, are drastically different. Toronto’s system exists exclusively to usher the masses from one place to another. On the other hand, Moscow’s Metro encompasses a form of remembrance which is simultaneously public, palatial and profound. Perhaps more importantly, the Moscow subway system is a historical artifact in and of itself. It simultaneously connects the city’s past with its present, the grandiose with the average, and the mundane with the sublime. It gets Muscovites where they are going while simultaneously reminding them of where they come from. In our country, with our public spaces so often devoid of any meaning, we would do well to heed Moscow’s example and remember our own history.